Some KKK members stumble or were lead to a raising of the undead. An undead warrior is raised he is a powerful killer. Who becomes his master not any of those who intended to. The black and white art is gorgeously presented here. 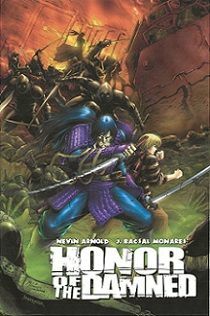 Steven does put up a friend in this undead samurai killing warrior. Steven is just a young boy yet he does want to be a hero. Can he this undead samurai make it in the big city? On the way to the city ninjas attack and it is fearsome action. Swords are drawn and blood does flow. Also on the way to the city, the samurai is given a name Sparky, and Steven and Sparky meet Bleesie. Bleesie right from the first time you see her you can just tell the way she is drawn and how she is written speaking that this is one amazing woman. The scene of the train wreck is awesome in its devastation. Steven and Sparky are doing the hero thing but they get no appreciation. We see an ancient clan of ninjas lead by the ruthless Master Kurogami. They will stop at nothing to get the undead samurai for their Master’s plans. As the ninjas attack they have also brought something else with them. The supernatural is strong with them. What grips Steven and Sparky are otherworldly. It has the feel of an ancient evil unleashed. A cop shows up to help Steven as Steven, Sparky and Bessie are under attack from ninjas and supernatural forces in the form of the so-called Squid Men. There is all out action as swords and guns and tentacles come into play. Here we learn who this undead Samurai was in life. He was just a man wanting a family and to live his life in peace. Steven finds himself in a particularly hard situation. His bravado shows us this is one brave boy. Sparky’s former leader narrates the tale of Sparky’s life and death. Master Kurogami has plans of his own and they are nothing short of world conquest. all that stand against him are a boy, an undead samurai, a cop, a tough woman and her witch mother. Are they enough? There is a beautifully done pin-up page showcasing this undead samurai aka Katsuro in a pose that inspires fear. So it all comes down to Katsuro aka Sparky aka the undead samurai vs the Serpent of Chaos aka a fire-breathing dragon. These two have one glorious battle. Steven has the adventure of a lifetime and finds a new family. This is a fun rollercoaster ride down the dark side for ten-year-old Steven.